Practice Areas: all complex litigation matters including construction, products liability, premises, auto and general negligence actions. David P. Feehan graduated from the University of Scranton with a B.A. in 1987. He attended St. John’s Law School and obtained his Juris Doctorate degree in 1991. Mr. Feehan began his legal career with the Kings County District attorney’s Office. During his tenure there he worked in many bureaus including appeals, criminal court, Supreme Court, investigations, civil rights, and grand jury. Mr. Feehan then went to the firm of Hoey, King, Toker & Epstein for the next fifteen years where he worked his way up from an associate to partner. He has been a partner for the last five years and also designated as the Brooklyn team leader. He handled high exposure, high complexity cases from inception through trial and appeal, including all motions, depositions, and discovery. 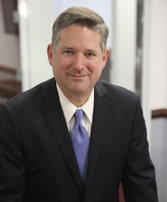 Mr. Feehan has extensive pretrial and trial experience in both State and Federal courts with over thirty verdicts and numerous others commenced. He has acted as both lead counsel and monitoring counsel on excess claims cases. He has written and argued appeals, and is admitted to New York State courts as well as both the Eastern and Southern Districts of New York Federal Courts. Mr. Feehan is a frequent lecturer for continuing legal education courses with a specialty in electronic discovery. Mr. Feehan is experienced in handling all complex litigation matters including construction, products liability, premises, auto and general negligence actions.